Plant diseases or blights in a hydroponics garden are much less frequent than in a dirt garden because there is no dirt to grow bacteria. Not to mention the fact that many plant diseases travel to the plant from the surrounding soil. 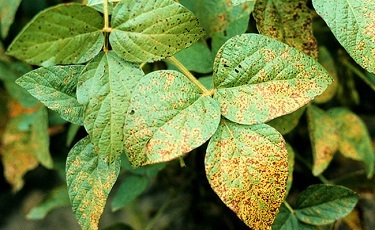 Plant disease cannot occur without a host plant, a pathogen, and favorable environmental conditions. Plants can be more susceptible to disease if weakened by environmental conditions such as too much shade, high humidity and crowded conditions. They are also more susceptible when weakened by nutrient deficiency or toxicity (too many nutrients) and poor pH. There will always be some trouble with disease, just watch for it and take care of it immediately. Unfortunately, many disease cures involve the use of harsh chemicals which you really do not want on your plants. A hydroponics garden can easily collect such chemicals in the nutrient solution with indiscriminant use and get into the plant cells - not something you want. Try some less harsh solutions first. Our favorite all-purpose cure is to mix water, baking soda, lemon juice and a very little bit dish detergent. Put this in a spray bottle and mist the affected parts of the plant. If you mix and use this recipe, make sure you cover all open areas to your nutrient solution or the dish detergent will get into it, causing soap bubbles. Description: Fungus causing whitish spots on the underside of the leaves. Eventually the leaves shrivel and die. Thrives in high humidity. Treatment: Spray with homemade all purpose cure described earlier. Description: Fungus rots a plants roots. Treatment: Cut away rotted root portions and spray with a fungicide. Description: Dark brown spots on leaves, stems and plant fruit seriously weakening the plant. Treatment: Treat with harsh chemicals (maneb, zineb). Description: A fungus affecting small plants where stems meet soil causing them to fall over and die. Treatment: Remove diseased sections. If it has affected a significant number of plants, replant in new soil and clean containers. Description: Grayish white, fuzzy leaf growth caused by inadequate ventilation. Not common in hydroponics gardens. Description: Slightly raised, powdery red pustules on the underside of the leaves causing them to turn yellow then brown and die. Helped along by high humidity. Very contagious. Treatment: Apply harsh chemicals like zineb or maneb. Description: Roots turn into a mass of club shaped tubers. Plants may become stunted. Description: Fungus causes plant to turn pulpy and rot. Treatment: Cut away rotted plant portions and spray with a fungicide.